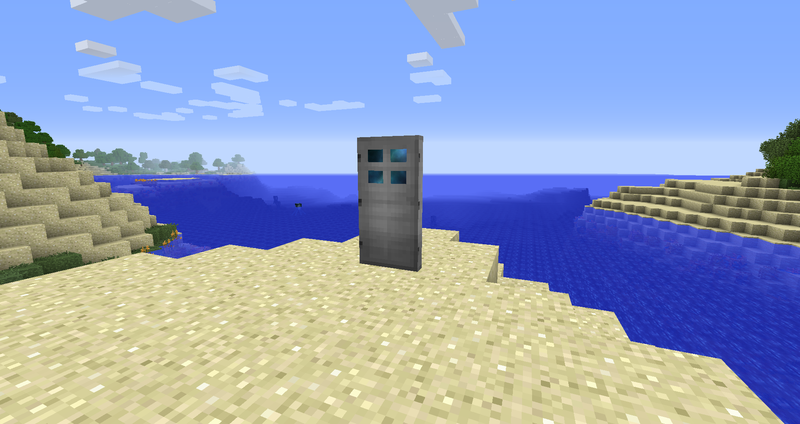 This mod is a Minecraft 1.12+ port of the Dimensional Doors mod originally created and maintained up to Minecraft 1.6.4 by Stevenrs11. This mod adds several types of Dimensional Doors that allow access to teleportation and extra-dimensional pocket dungeons that can vary from hallways to mazes to treasure rooms to straight up traps. Have fun exploring, but be wary of death or falling into the void as you do not want to end up and perish away in the mysterious and nihilistic Limbo dimension! NOTE: Descriptions on items in-game may not reflect their current or intended purpose and/or functionality (yet). Oak Dimensional Door: Easy to make, but not very useful. In dungeons, it will typically lead back to the previous pocket, but sometimes a second Oak Door in a dungeon will lead back to the dimension where the player first entered this chain of dungeons. 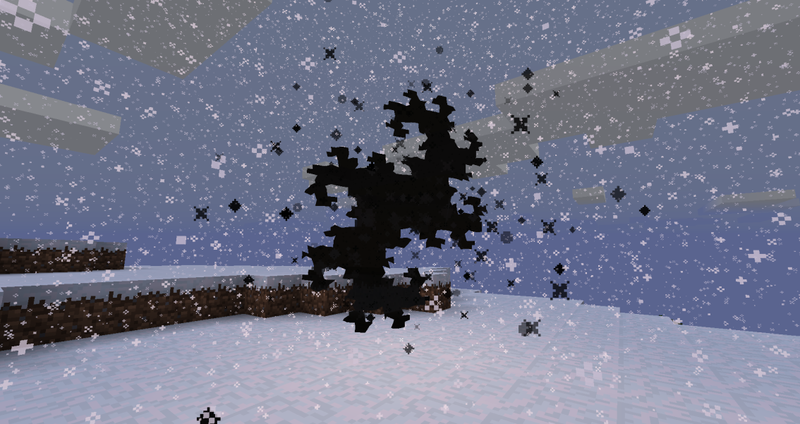 Iron Dimensional Door: Placing one in the world will create a new and empty dimensional pocket, a black void in which you can build whatever you want: a small house, a statue, a farm, a huge base, or even a whole city! Quartz Dimensional Door: Similar to an iron dimensional door, except that all quartz dimensional doors will lead to the player's personal pocket. Gold Dimensional Door: Very expensive to make but worth it. Leads to a pocket dungeon full of treasures, puzzles, and traps. Unstable Dimensional Door: Crafted using an eye of ender instead of an ender pearl. Randomly leads to a rift or another door. Other Doors: Through the door's NBT, it is possible to configure a door (of any kind) to create any type of rift when placed, such as a "dangerous door" which has a 50% chance of leading to limbo and 50% chance of leading to a treasure-filled dungeon. In future versions, such bonus doors will be rarely found in dungeon chests. Rifts are fractal-shaped tears in the world. They form when a dimensional door is destroyed and is no longer binding together the fabric of reality. To pass through a rift, you can either place a dimensional door on it, or right click it using the rift blade. They also form naturally in extremely rare formations called "Rift Clusters", which lead to other very far away clusters. Rifts will grow logarithmically over time. You can use a rift remover to close rifts that got too big, or a rift stabilizer to stop a rift's growth. Stabilized rift signature: First click binds it to a location, other clicks create rifts leading to that location. Rift blade: Teleports the entity you're attacking several blocks away. Right-clicking on a rift causes you to enter it, without having to use a door. Dungeons are special kinds of pocket dimensions filled with treasures, puzzles, traps, and dimensional doors leading to deeper dungeons. Although it might be tempting to break walls and bypass a puzzle, be careful of monoliths that may be waiting right outside those walls to teleport you to limbo! A dungeon can either be entered using a gateway, a rare structure that can be found throughout the world, or by using a gold dimensional door. Fabric of Reality: Completely black block that absorbs all light. It can be replaced by right clicking with a block, or mined using a silk touch pickaxe. Be careful, this looks exactly like the void in dungeons! Altered Fabric: Fabric of reality that has been altered to become white, or any other color. White altered fabric is found in personal pocket dimensions. Other colors can be crafted by combining Fabric of Reality with a dye. Altered Ancient Fabric: Colored variations of Eternal Fabric. It is uncraftable since eternal fabric is unobtainable, but the white one is found in personal pockets. 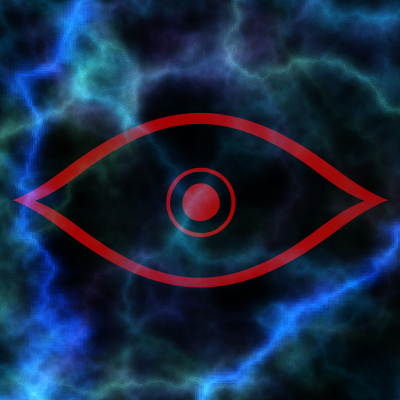 Eternal Fabric: Found deep in Limbo, providing a way for players stuck in Limbo to escape. Soon to become eternal fluid. A dark, foggy, and mysterious dimension filled with monoliths, where players who died or tried to cheat in a dungeon end up. Q: Why am I set on fire when leaving a Pocket Dimension? A: It's a Vanilla bug. The same often happens if you use Nether Portals built on very low y-levels in the Nether, or, if you are extremely unlucky, anywhere in the Nether, to get back to the Overworld. Q: When going to Limbo, by dying or jumping into the void, I lose all of my items. Is this intended? A: At the moment, the only way to enter Limbo is by taunting a Monolith. The only other way to enter is by dying, which, if keepInventory is turned off, will drop all your items. This is not 100% intended behaviour and we do plan on changing this. Falling into the void should not kill you, but send you straight to Limbo, making you keep your items. Dying in a Dungeon Pocket should send you to Limbo and make you lose your items, however a config option should be added to allow you to keep your items. We are aware that only a select few Pockets are populated with Monoliths at the moment. If you mean to substitute the texture like with a texture pack, this is the texture you are looking for. So you basically want to disguise them as normal doors then, hmm? Well, it's a PNG picture, so you could try setting the alpha channel of the whole picture to 0 (a.k.a. making the picture completely transparent) to see what it does. is there a way to disable rift clusters? Hello! I was taking a look at the mods config file and I wanted to ask what the "D:gatewayGenChance, B:dangerousLimboMonoliths, B:hardcoreLimbo, B:universalLimbo" settings meant. I assume that gatewayGenChance is Dimensional Doors' spawn chance, but I don't have any ides on the other ones. Can you please tell me? Also adding information on what they do inside the config file (by using "#"?) might be a good idea. B:universalLimbo if you set this to true, dying anywhere will send you to Limbo. Not just Dungeon Pockets. The other ones make Monoliths in Limbo aggressive towards the player and make them teleport the player back to the top of Limbo. Config information is added perfectly fine in the recently added ingame config editor, but doing so somehow made the config files almost worthless. I have a quick question: In the description of this mod, you claimed you could build a city in one of these dimensional pockets. I believed this once I came across pockets within dungeons that took up a huge amount of space (the nether mine-shaft one specifically). However, upon creating a pocket myself, it appears that these pockets are far too small to build anything of impressive scale, unlike some of the pockets in the dungeon. Is there any way to increase the size of a pocket? Far too small? The default pockets are 9 chunks in space, if they seem too small when using an iron or quartz dim door, then the config might've been modified to reduce the size. All of my pockets are a 2x2 chunk area (if you mine out all the fabric of reality). Many of the pockets in dungeons don't have these limitations. Again, the description says you can build "a whole city" in one of your pockets. I dunno about you, but I don't think a 32x32x32 block area is anywhere close to large enough to make a city, not to mention a good-sized mansion. When I posted this I hadn't done anything to the config, but when I tried changing the pocket size options my game would crash whenever I entered a pocket. I want either a pocket with no ancient fabric at all or a much larger pocket, similar to the aforementioned nether mine-shaft pocket. I believe the default size for personal pockets is 3x3 chunks and public pockets is 2x2 chunks actually. As Zombie suggested, the maximum size should be configurable, but before doing so, you may need to increase the grid size as well. So firstly, your Minecraft Forums thread is gone due to their purchase by a new company, and various idiotic responses to European regulations. See the relevant threads there for details, including hope for getting your posts back. Because I that, I can't research the answer to my question: Where do I get dimensional thread? It's needed for most of the items, but there's no crafting recipe, and mining Eternal Fabric gets (admittedly cool) blocks. After the forum thread's restoring: World thread comes from pocket-dungeon chests (too bad, I haven't opened a chest without blowing up the dungeon yet) or from rifts eating blocks (which mine don't seem inclined to do, and I can't even piston blocks into the rift space). ETA2: And elsewhere the dev says that rifts don't actually eat blocks anymore. And yes, World Thread will be a fairly limited chest-loot only item for the time being. Also, the CurseForge page and the Discord are the best sources of information regarding the mod. The Minecraft forum will be least likely to be kept up to date. It does seem that you've got your own thread back at least; best of luck to all your buds in the European moddev community. I've already said my piece on this in the forum threads on the topic, but lets just say I'm not impressed by citricsquid's handling of this thing. It's like they've forgotten that Minecraft wasn't actually born in America.